Moulton’s alternate persona, Cynthia, moves between domestic spaces, technology, and mental (if colorful) breakdown in her ongoing video series. In Whispering Pines 10, she inhabits a virtual environment of live animation alongside an electronic opera score by Hallett, featuring soprano Daisy Press. Moulton’s alternate persona, Cynthia, moves between domestic spaces, technology, and mental (if colorful) breakdown in her ongoing video series. In Whispering Pines 10, she inhabits a virtual environment of live animation alongside an electronic opera score by Hallett, featuring soprano Daisy Press. 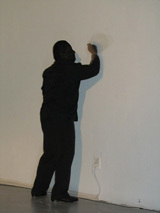 Performed July 19, 21, and 22, 2012 at SFMOMA as part of Stage Presence. Thursday, July 26, 2012, 7:30 p.m.
Thursday, August 2, 2012, 7:30 p.m.
Thursday, August 9, 2012, 7:30 p.m.
Thursday, August 16, 2012, 7:30 p.m.